This VAT change for sales has now been run by everyone. Some may not have run the options to change VAT rates for suppliers and nominals yet. Our program has proven to save a lot of manual effort and there have been no significant issues relating to the VAT changes program. Thank you for your patience over the New Year / start of January period. When you need to change the VAT rates for suppliers and nominals, download the program again from here and run the last options (8 and 9). The program will show you the options you have run already. Below is more information about the change itself and what you have to do. 30/12/9: Version 6 released. Further FAQs have been added. Note: Installing and running the VAT Change Program will not make any changes to the database until you select one of the update options. As there are more options available this year, it is worth installing and running the program to review the options. IMPORTANT NOTE: AS THIS DOWNLOAD MAKES SIGNIFICANT CHANGES TO YOUR DATABASE IT IS CRUCIAL THAT YOU BACK-UP EACH OF YOUR LIVE DATABASES BEFORE YOU START. Wholesalers: You can use Version 5 or 6. The download below is Version 6. Retailers: If you do not wish to invoice all outstanding sales orders now at the old rate and you do not wish to invoice the deposits paid against outstanding sales orders now then you can use Version 5 or 6. If you require to generate special invoices in December for either the deposits paid or the full order value at the old rate then you will require Version 6. The download below is Version 6. TO DOWNLOAD VERSION 6. . . Click the link below to take you to our “box” download site. You then need to click the “Download (160.6 KB)” button on that page. FAQs regarding the VAT change have been provided at the end of this blog. Any queries, call the helpdesk on 0131-448-0483 or email support@oltd.co.uk. As our lines may be busy, please also keep checking back to this web page where we will post any other significant information regarding the VAT rate change. Thursday 24th December – Closed. Friday 25th December – Closed. Monday 28th December – Closed. Tuesday 29th December – Emergency Service (call 0131-448-0483 or email support@oltd.co.uk). Wednesday 30th December – Emergency Service (call 0131-448-0483 or email support@oltd.co.uk). Thursday 31st December – Emergency Service (call 0131-448-0483 or email support@oltd.co.uk). Friday 1st January – Closed. Monday 4th January – Open. Q. When should the VAT update be run (before or after month end and which month end)? 1. Run the “Purchase / Nominal” period end for the end of November (if not yet run). 2. Finish posting all sales orders for December. 3. Complete normal end of day / month programs, such as SOP – End of Day – Invoice Summary / Update to invoice December’s invoices. 4. Download and run the VAT Change module (not options 7 or 8 yet). 5. Run the “Sales / Product” period end for the end of December. 6. Later in January, run the VAT Change module options 7 and 8 once the bulk of supplier / nominal postings for the old VAT rate have been posted. Q. Do I need to download and run the program on our server? A. No. use your normal client PC. Q. 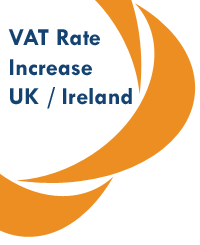 Does this VAT Change module work for Southern Ireland? A. Yes. The program knows your locality and will update your system with the VAT reduction. Q. Does the VAT Change module change the customer’s selling prices on sales orders that are outstanding at the end of December? A. The update will change the VAT Rate on sales orders outstanding to the new rate. If you have the Optimise Trade system then the goods value will not be changed – it is just the VAT amount that will be changed when the invoice is raised. If you have the Optimise Retail system then the goods value is reduced slightly (increased for Ireland) such that the total price to the customer is unchanged. There is an option to change prices but you have the choice of whether you run that option or not. Q. If I have more than one database, do I need to run the VAT Change module on each one? A. Yes. Best thing is to download it from the website and run it on the first database. Once finished, download again and run it on the second database, etc. You don’t need to run it on your test area but you may find it useful. If you have more than one database remember to back up each database before you start. Q. Can I run the VAT Change Module on the server, e.g. using remote desktop? A. Yes. It is designed to run from a client but should run on the server. Q. Can I test the VAT Change program on our test database whilst users are logged into the live database? A. Yes. When the VAT Change program runs you select the database to change. Only that database is changed and users only need to be logged out of that database. Q. I downloaded Version 5 already. Should I run that or do I need to download and run Version 6 instead? A. You should download the latest version now. However Version 5 will be ok to run, depending on your circumstances – refer to the wholesalers / retailers section at the top of this blog for information about which version to run. Q. I have run Version 5 already. Should I run Version 6? A. No. If you have run Version 5 and all options you needed were available then you do not need to run Version 6.